Habit: Plants generally in soil; rhizome short- to long-creeping, prostrate to erect, [trunk-like], scales generally hairy, +- brown. Leaf: stipe ×-section at base with 2 crescent-shaped vascular strands fusing into 1 U-shaped strand distally; blade 1-pinnate, generally with needle-like, clear hairs on axes and/or between veins; rachis, costae generally grooved adaxially except between axes; veins free or in regular, net-like pattern. Sporangia: sori on veins, generally round; indusia reniform or round-reniform ; stalk cells in 3 rows; spores generally elliptic, scar generally linear. Genera In Family: 1 genus (5--32 genera), +- 1000 species: worldwide, especially tropics; several cultivated. Leaf: pinnae entire to generally deeply lobed, veins generally not forked. Habit: Rhizome creeping, 1.5--3 mm wide; generally dormant in winter. Leaf: densely clustered, generally 40--100 cm, 8--15 cm wide; stipe scales ovate, tan, persistent; blade thin, abaxially with many short-stalked or sessile, resinous glands between and on veins, nonglandular hairs sparse on axes, veins, 0 between veins; pinnae deeply lobed, lobes +- oblong, entire to shallowly crenate. Sporangia: sori small, round; indusia hairs 0 or sparse. Ecology: Springy hillsides, seepage areas; Elevation: 365--1700 m. Bioregional Distribution: KR, NCoRO, n SNH; Distribution Outside California: to British Columbia, Idaho. Note: Locally forming large colonies. Differs from Athyrium filix-femina in having longer, thinner rhizome, thinner leaves, more numerous reduced proximal pinnae, more entire lobes, rounder sori. 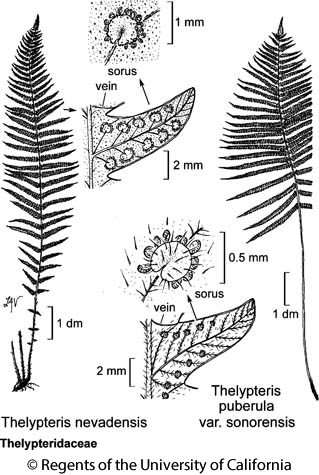 Citation for this treatment: John C. Game, Alan R. Smith & Thomas Lemieux 2012, Thelypteris nevadensis, in Jepson Flora Project (eds.) Jepson eFlora, http://ucjeps.berkeley.edu/eflora/eflora_display.php?tid=46421, accessed on April 22, 2019. KR, NCoRO, n SNH; Markers link to CCH specimen records. Yellow markers indicate records that may provide evidence for eFlora range revision or may have georeferencing or identification issues. Purple markers indicate specimens collected from a garden, greenhouse, or other non-wild location.